Sometimes a great novel is easy to pass over for its simplicity, its small size, its apparent lack of a grand vision. A large, tumbling novel filled with a plethora of characters and intricate plot can pull a reader in and offer a variety of avenues to explore. Thus the temptation to quickly read Adolfo Bioy Casares’ The Invention of Morel as a short, shallow work of science fiction. Instead, it is a cleanly written exploration of such major themes as immorality, love, friendship, and our purpose in life. It weighs in at around 100 pages. 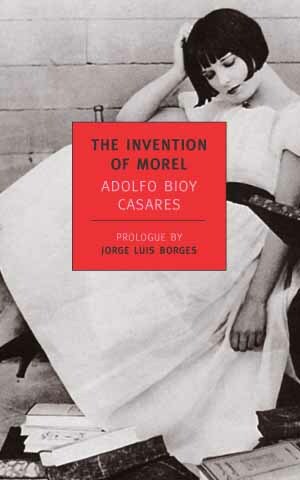 The novel was written in 1940 and received lavish praise from no less important figures than Jorge Luis Borges (“To classify it [the novel] as perfect is neither an imprecision nor a hyperbole”) and Octavio Paz (“The Invention of Morel may be described, without exaggeration, as a perfect novel”). It is labeled as a science fiction novel, but it does not fit any stereotype which that label brings. Instead, the little used genre of “fantastic” literature, which is part of the title of a work Casares edited with Borges (Anthology of Fantastic Literature), fits better. The basic premise is that an escaped prisoner, our narrator, finds himself on a deserted island, which after some time no longer appears deserted. A building falling into disrepair is suddenly reborn in its splendor and populated with people. The narrator works to avoid detection and watches from afar, even falling in love with one of the women. Throughout he tries to understand what role he is playing in this new world around him. To avoid spoiling the plot, allow that short summary to stand. But what the story’s emerging resolution raises are questions of what constitutes immortality and conversely, what gives life its purpose. Can a god-like person truly have control of our life and if so, do we desire that? Are we actors in a larger play or do we determine our direction? This also brings about questions concerning relationships and love. Can we love from a distance? Is there not a need for interaction? In other words, many questions without moralistic answers. The narrator does wrestle consciously with some of these issues while others seem to elude him. But in the end the reader is left to ponder these issues alone. While short, the book is not a quick read. It is translated and at times feels clunky, but that also fits the narrator’s thinking and confusion as the story emerges. I’m not going match Borges and Paz in their praise (although if they were alive I would not want to argue with them either! ), but this is an important book to put on your reading list if you have not already come across it. I would have missed if not for my oldest son giving it to me as a gift (for which I again say thank you). Some books are way too long! This one sounds great!